Dr. Emily Hall has been awarded the 2018 Virginia Reber Public Health Award. The award honors individuals who further public health principles in Lake County or the Flathead Reservation. 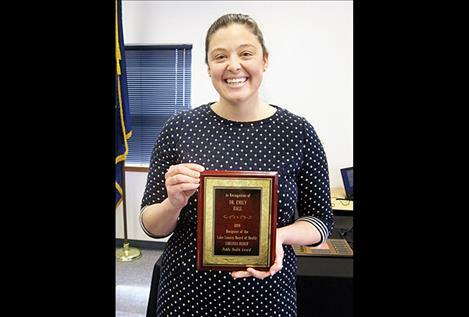 POLSON — Lake County Board of Health has presented the 2018 Virginia Reber Public Health Award to Emily Hall, DO. Dr. Hall is a pediatrician at Providence St. Joseph Medical Center in Polson. This award honors a county resident or entity that has furthered public health principles in Lake County or the Flathead Reservation. Members of the Lake County Public Health office, who nominated Dr. Hall, cited several of her extraordinary talents, including: supporting the new initiative to incorporate mental health screening into well child checkups, emphasizing early intervention in identifying potential health problems, assisting in the Bridge to Hope and Wrapped in Hope programs, (These help families with newborns that have been prenatally exposed to medications and are now struggling with withdrawal stay together by providing critical care newborns need to overcome the effects of drugs in utero. ), implementing an inpatient and outpatient Lactation Clinic to support breastfeeding families, serving on the Fetal, Infant, Child, Maternal Mortality Review team, which is currently working on a Safe Sleep Campaign, promoting and supporting Certified Lactation Counselor training, and being instrumental in finding health care for a special needs foster child. The Lake County Board of Health Award is named after Virginia Reber, RN, Public Health Nurse and pioneer of public health in Lake County. She is responsible for laying the foundation for the growth and development of what has become the public health services program in Lake County today.